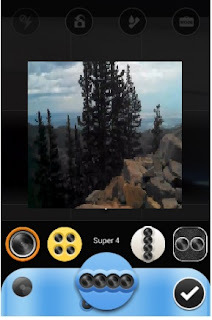 Android App Review - Cymera - Camera and Photo Editor by SK Communications. This is a semi professional camera and photo editing app, specializing in portraits and face editing in photos. The app has its own facial recognition software which identifies the face and then offers the user a rich variety of editing tools to enhance, change and edit the face, from changing eye colors to changing hair styles and applying make up and "beautifying" effects to faces. A very cool app, it also offers several kinds of filters and a large variety of graphical objects that can be easily incorporated into the photo. Last but not least, it also offers collage building services, to create a large collage of photos. Our testers mostly loved the interface and learning how to apply the various effects was fairly easy, even for those testers who weren't especially computer savvy. Yet again, with a little work you can create great effects, especially with faces. Facebook fans would find this app very handy as its interface allows quick and painless Facebook sharing of photos. There's no doubt this is one of the best camera and photo editors for the Android today, with its editing capabilities coming just short of professional editing abilities but with the ability to open the app, take a picture, edit it and post it remarkably quickly. Score: 4.5 out of 5. Most of our testers enjoyed it immensely. Description: A camera app and photo editing app, this app has extensive photo editing capabilities to enhance and change faces, adding makeup, changing hair styles and rearranging faces to make them more "beautiful". In addition to filters and photo enhancing modes, this app also has the ability to add graphical objects from a large library to any photo and the user can also download for free additional effects and objects for adding to pics. Good Points: Different lenses and editing effects providing great pictures and diverse editing abilities for the face. Beautifying capabilities to add makeup, change hair styles and bring out the beauty in faces on the photos. Bad Points: Text editing - adding text to pictures is not intuitive and is a bit hard to find. The app appeals strongly to Facebook users who upload photos regularly - people who're not heavy Facebook users may find the interface a bit clumsy. There were some minor issues with some of our testers who couldn't turn the flash on for taking pictures or others that complained the pictures come out horizontal and stretched instead of vertical. Experience: To be honest, some of our testers started examining Cymera Camera after working some time with Line Camera. Nevertheless, most of them were quite enthusiastic about Cymera. Most cited the face beautifying effects as one of the best features of Cymera. There were some small problems wtih taking pictures and editing HD photos but those were quickly remedied. In conclusion, the more a person uploads photos to Facebook, the more he or she love Cymera Camera more, at least in our experience. In our words, our teen testers loved it the most.